The Goth warriors were born of barbarian ancestry and were vicious warriors that could fight the most trained and skilled foe. The Goth warriors battle hardened skills, and their passion for the fight were more than a match for any fellow warrior on the battlefield. The Goth warriors came from the north, their old home, and they would travel, they would fight, they would travel more, and no man woman or child could stop the Goths and their warriors, from going exactly where they pleased. The Goth warriors were in fact the fighting force of the larger Goth tribe and they were Germanic people from the east of Europe. The Goths would eventually play a huge role in history with their battles and conflicts and alliances with the Romans, which is of great importance to how the world we live in currently is shaped. The Goths after their first travels from Scandinavia consisted of two major groups, the Ostrogoths and the Visigoths. Both groups had their own individual traits and practises but sharing the same name in part. Both groups eventually settled in different parts of Europe but both experienced similar dominance and power, testament to the strength of the original Goth warriors and their tribe. Adding to their overall mystique, the origin of the Goths and their warriors is shrouded in mystery. Legend has it the Goths started life on the south coast of Scandinavia, where they travelled across the ocean by boat under the guidance of their first king, King Berig. The tale tells it that only three ships crossed that night, and the Goths moved quickly to the southern coastline of the Baltic Sea. While the split of the two Goth groups is not well known, we are confident however of the two defined groups of the Goth tribe, the Visigoths and the Ostogoths. The split of the two groups is said in some legends to have occurred around 300. The Visigoths lived of the west of what is now Italy, they spread from the bottom of modern France into most of modern Spain and Portugal. Almost nomadic, the Visigoths after their separation from the main Goth tribe, crossed a large portion of southern Europe before settling on a home. Famous for their invasion of Italy, where they dispensed of the Roman rule in Rome itself, the Visigoths continued their journey west eventually dropping their nomadic nature and settling in the warm country of what is now Spain and Portugal. This would later be known as the Kingdom of the Visigoths. The Ostrogoths lived in what is now Italy and spread east across modern Slovenia, Croatia, Bosnia and Herzegowina and further. This area at the height of the Ostrogoths presence was known as the Kingdom of the Ostrogoths and of course included the state of Rome itself. Famed for their battles with the Huns, the Ostrogoths and the Huns went through various stages of agreement and war. The Ostrogoths lost their initial meeting with the Huns, who were then under the rule of the famed Attila. Later the Ostrogoths would regain their control under the guidance of Theordoic, who while battle savvy was also an excellent mediator and tactician, and a huge asset to the Ostrogoth tribe. The weaponry of the Goth warriors was not quite as important in their success as their battle skills and barbaric fighting talent. The weapons they did use though were similar to many other Germanic warriors of the time, and due to the nature of their alliances with the Roman empire at various times, the Goth warriors would also often carry Roman weaponry. The Goth warriors were often mentioned as preferring the sword over the spear, which was traditionally a common weapon with Germanic warriors. The sword would typically be a broad sword with a double edged blade. They would also carry a lance, pike or javelin, basically a form of spear based weaponry, although even more varied weapons have been found to be owned by Goths, like maces and scythes. Goth warriors would be armoured to a similar level of many of the Germanic tribes of a similar time, they typically wore tunics and trousers, with chain mail and simple helmets. Some Goth warriors would wear breastplates or Roman armour, although it was more common for them to keep Roman weapons but discard their armour, perhaps finding the heavier Roman body armour too limiting for their natural fighting style. The Goth warriors also carried a shield too, which was traditionally rounded and used for protection and offensive attacks alike. The Goth warriors were travelling people, conquerors and of course fighters. Their tribe grew in size, in skills and in belief. 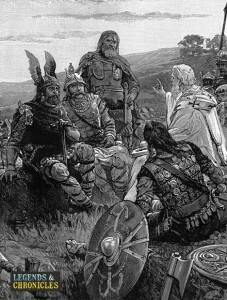 The Goth warriors were the first Germanic fighters to convert to Christianity, and fought in mighty battles with and against the Romans. 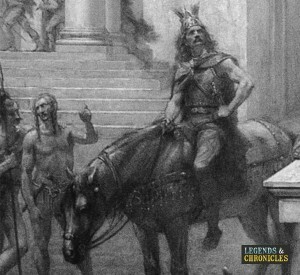 Slave to no man, the free man belief of the Goths is probably what enabled them to become one of the most important Germanic tribes of all time. Fierce and barbaric on the battlefield, you would do well not to try and tell a Goth warrior what to do.